Chief Executive Officer of Orange Telecom Sierra Leone, Aminata Kane Ndiaye, has disclosed that the company is operating in over twenty five countries across the globe, adding that they were operating in over twenty countries in Africa, serving over one hundred and twenty million people. 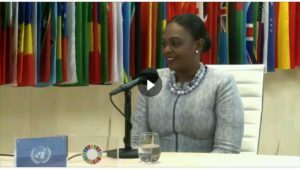 The 34 year- old CEO made the disclosure during an interview on Facebook live from the United Nations 73rd General Assembly in the United States of America where she was invited by the Global System for Mobile Communications to be part of a panel discussion to chart the way forward on how telecommunication operators could play a role in the development of Africa. According to her 2018, it was the first time for her to be part of the United Nations General Assembly and that one thing she found interesting, constructive and positive about the event, was the great dialogue between public, private sectors, Non-Governmental Organisations, government and businesses. She noted that she participated in a panel discussions organised by the Global System for Mobile Communications, and that lot was discussed about mobile for development and how operators could contribute to growing countries specifically in African. She said they also had discussions in the area of data, adding that Sierra Leone Minister of Information and Communications, Mohamed Rado Swaray, was part of the discussion panel between the private and public sector about what could be done about the usage of data. She said the Sustainable Development Goals ( SDGs) were at the core of their strategy and of ambition because they were simply serving the fundamental basic needs of the people, citing the need for money and for them to be included in the financial sector and industry. She said for the past decades, banks have been doing great job in providing money, credit or loans to businesses and individuals, but up to date, the banking rate was below twenty percent in most African countries, adding that they came up with Orange Money service to help solve that problem. She said in 2007, they launched in Ivory Cost, a mobile payment system that allowed people to do transaction with money stored in their phones, and that they were now extending it to micro loan and savings as they have done in Madagascar and Mali, this year. She disclosed that they were working on making basic needs available to the people and that one of the good examples they were doing that was in line with the SDG was energy, noting that if two third of the African continent was not covered by energy, then Orange Telecom could provide solar panel kits in the whole continent by leveraging two things that they have. She noted that they first needed network proximity so that they could have over nine hundred thousand retailers across the continent to make business easy for their customers. The CEO continued that when someone acquires the solar panel, he or she can be able to pay at the end of the month through Orange Money services which makes it easier and cheaper for them. She said in the Democratic Republic of Congo, Guinea, Senegal and in the past month, they have already sold more than three thousand kits in the Democratic Republic of Congo. She said the company believed that bridging the gap for women was going to make them more efficient and more profitable in the end and not only physical idea, but also tangible. She disclosed that they have been proving opportunities for women by mentoring and teaching them and also providing dedicated offers for them to data bundles and other facilities and the rest.